Nothing would have a larger or more immediate impact on travel throughout the Midwest than new, modern train equipment. Please join our effort to replace and expand Amtrak and Metra's aging train fleets. The train equipment itself affects everything that matters to both riders and operators: comfort, speed, safety, operating costs, ridership and revenue. Putting new trains in service throughout the Midwest would enable more frequent departures and faster trips on existing routes. Most of the trains operating in the Midwest today are 20 to 40 years old. Some Metra coaches are more than 60 years old! If they were cars, they would be considered antiques. Modern train designs, like new cars, are safer and more practical. They are strong yet light, allowing them to accelerate quickly but also protect passengers better in case of a crash. They have a low center of gravity and sophisticated suspensions that allow faster running through curves and give a smoother ride. They will make your trip more enjoyable, and be more reliable, too. Thanks in part to the efforts of our members, Amtrak has already replaced some of its locomotives, and has a limited number of new coaches on the way. However, we'll need much more new equipment to bring more fast, frequent and reliable trains to the Midwest. You can help us build off this momentum by contacting your elected officials and joining our cause. Tell Congress to invest in high-speed rail. Trains have always been a great way to travel, but modern train designs make it even better. They offer a variety of spaces to accommodate the demands of different types of passengers. Coach and first-class cars include several seats that face a table, making it easier to get work done or have a meeting. 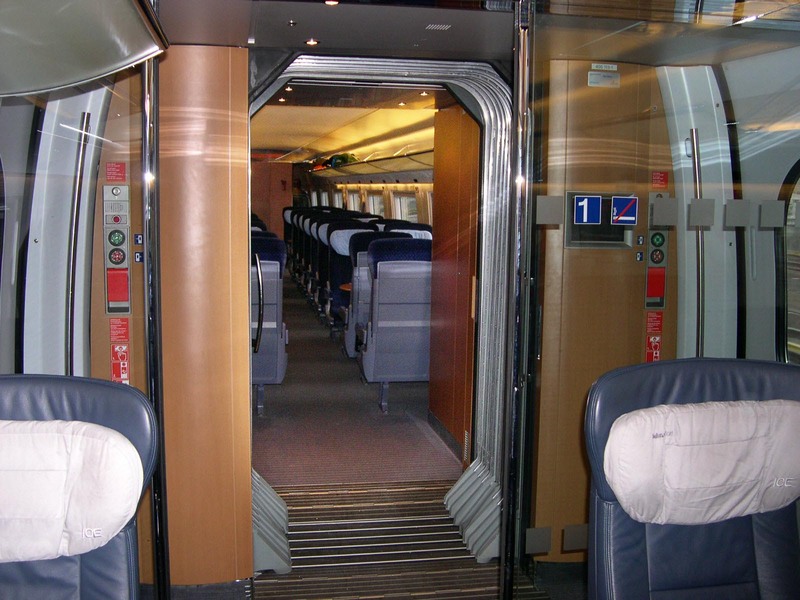 Some train designs include private lounges or conference rooms, as well as special play areas for kids. Power outlets and Wi-Fi are available throughout the train. Overhead shelves let people keep bags nearby, while racks near the doors are a better place to leave larger items. Bicycles roll right on and are secured in special holders, so passengers can take them on and off without any special attention. The cafe cars offers a place to grab a quick bite or a drink, while a more formal dining car serves full-service meals. Automatic gap fillers allow level boarding from high-level platforms that are compatible with freight trains. 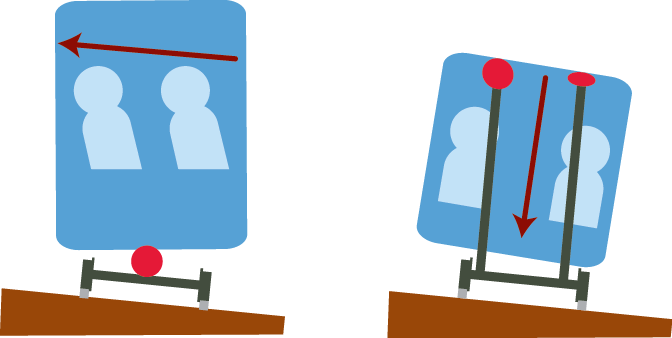 Level boarding, where the floor of the passenger car is level with the station platform, makes station stops faster, easier and safer. It helps passengers with limited mobility and those pulling luggage by removing the need to climb stairs. It also removes the need to have doors be attended by train staff, meaning all doors can open instead of just a few. Removing this bottleneck prevents long, slow lines of passengers alighting and boarding and keeps station stops short. Closing the gap between cars is safer and more comfortable for passengers. Most trains in the United States are made of individual coaches that are coupled together, but walking between these cars can be a nuisance, or even dangerous. Whenever someone opens the door to pass from one car to another, noise and drafts from outside enter the passenger space. The footplates between cars can suddenly shift on rough track or in curves, posing a pinching or tripping hazard. The gap between cars allows snow and rain to enter the vestibules, creating slip and fall hazards. During winter, employees must routinely salt and shovel these spaces between cars. Keeping cars together in a unit trainset allows for nearly seamless, weather-tight walkways. This eliminates the nuisances and safety hazards of passing between cars. It also makes the ride more comfortable for everyone by eliminating noise and drafts of outside air. Ready to see high-speed trains in the U.S.? Tell Congress! 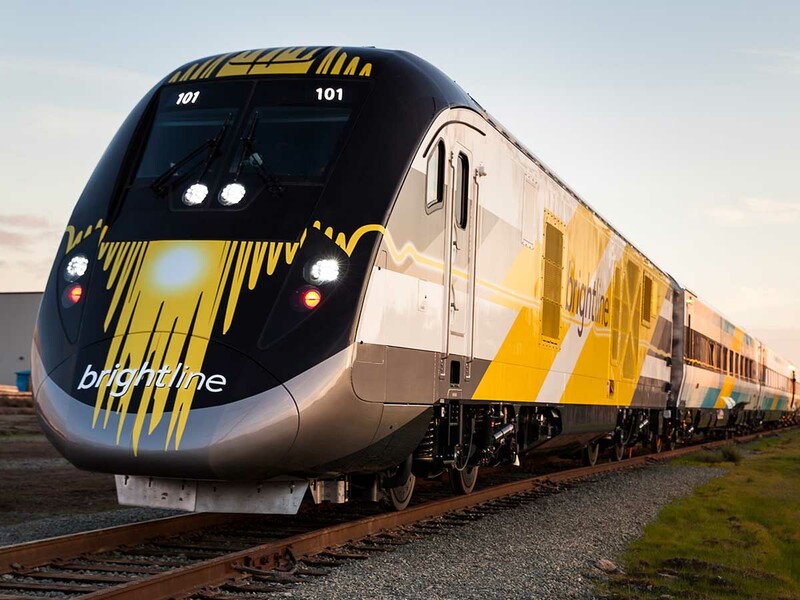 New trainsets for Florida's Brightline service work as semi-permanently coupled units that have locomotives at both ends. Most Amtrak and commuter trains in the U.S. are made up of individual coaches pulled by locomotives. The understanding is that this creates flexibility to size the train to fluctuating demand and to pull out a single car for repair rather than sideline the entire train. These apparent advantages have their downside. Switching out cars is expensive and slow, and increases the probability that something may go wrong. It also discourages the discipline needed to prevent malfunctions from occurring in the first place. Keeping the cars together in semi-permanent unit, or “trainset,” motivates the operator to conduct regular maintenance to keep the entire train in service. 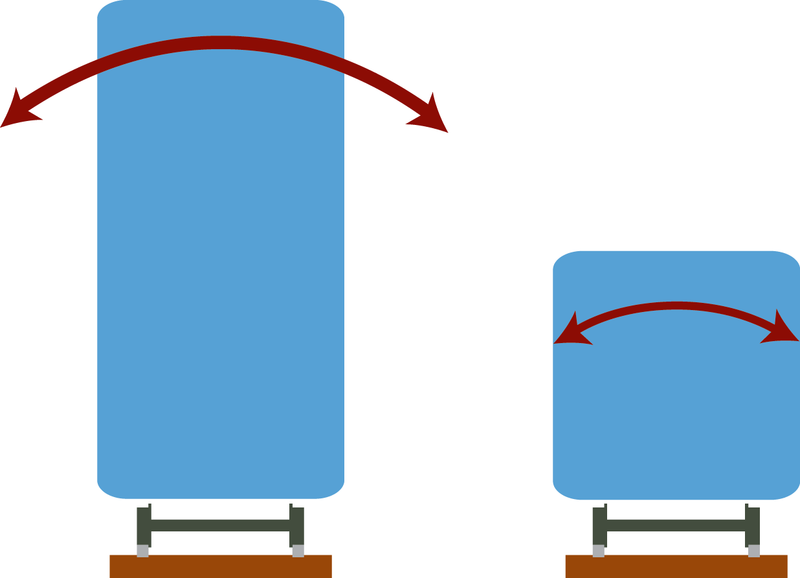 Trainsets also allow for better management of the forces created in a collision. In a crash, the outdated design of today’s U.S. passenger fleet focuses compression forces on the coupler face, improving the odds that the train will jackknife or roll over. In contrast, these forces are managed better in a unit-train design, keeping the vehicle inline and upright and reducing injuries and fatalities. A trainset should also have driving cabs on both ends, so that it does not need to be turned around at the end of a route. At the end of many Midwest routes today, Amtrak must turn the train around, or decouple the locomotive from the train and switch ends. These complicated and slow maneuvers waste money and prevent tighter train schedules. For years, federal regulations have required that passenger trains be very heavy for the sake of safety. Our nation's fastest train, the Acela, has been called a "high-velocity bank vault." Meanwhile, modern high-performance passenger trains around the world are lighter than their U.S. counterparts without sacrificing strength or safety. They use advanced construction technologies and materials, using crash energy management and minimizing weight by replacing heavy frame structures with aluminum corrugated box construction. Fortunately, regulations in the U.S. are being updated to allow these modern, lightweight trains. Lighter trains accelerate more quickly, stop sooner and run more efficiently. Acceleration and deceleration are important to travel time. The sooner a train gets back up to cruising speed after departing a station, the higher the average speed will be over an entire trip, reducing travel time. It makes all traffic on the railroad flow better. Lighter trains also cause less wear and tear on the rails. The heaviest part of the train is the locomotive. It needs to be heavy to keep its wheels from slipping. Lighter weight train sets can be pulled by lighter weight locomotives with the added benefit of reduced fuel or electricity consumption. Multiple-unit trains dispense with the locomotive altogether by spreading the motive equipment throughout the train. These trains can be powered by overhead wires, diesel engines, or both. Keeping a train's center of gravity low allows it to take curves faster and reduces sway on rough track. For the same reasons that a low-slung sports car can takes turns faster than an SUV, a train with a lower center of gravity can take curves faster. They lean out from curves less and put less force on the outer rail. While high-speed lines have gentle curves and are very smooth, the Phased Network Approach has trains using existing, older freight track for parts of some journeys. Slowing down for a curve reduces average speed, so trains that can take curves faster are critical to achieving competitive transit times. They also have the advantage of swaying less on rough track, adding to passenger comfort. Talgo articulated trains with tilting technology cut 30 minutes from the 150 mile trip on Amtrak's Cascades corridor, and would have similar benefits on the Chicago to Detroit corridor. 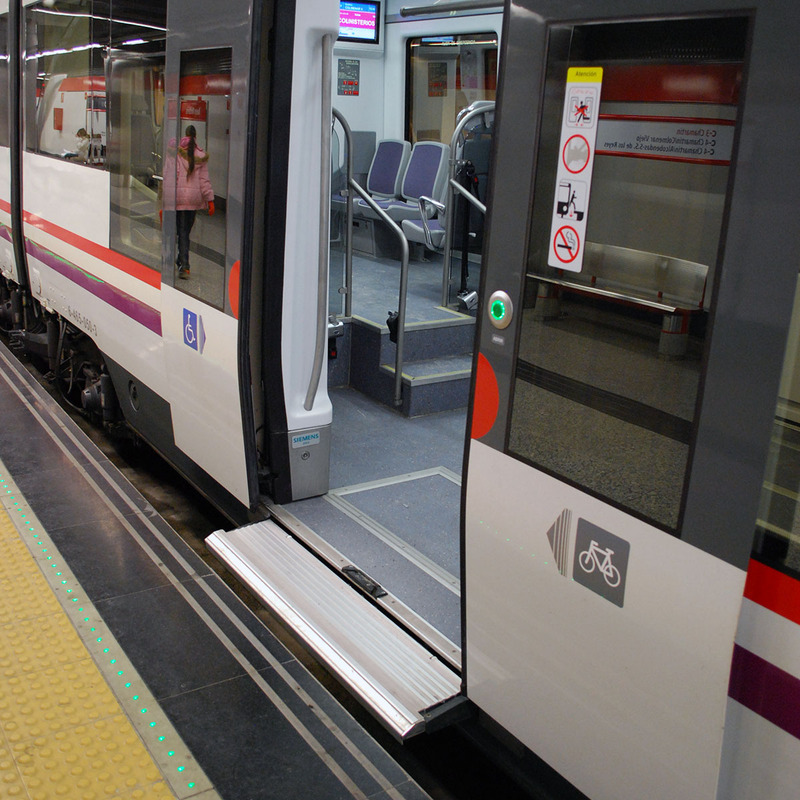 Articulated trains, in which passenger cars share “trucks” (wheel and axle assemblies) with the adjoining cars, improve average speed, passenger comfort and safety. While this configuration sacrifices some capacity per train length and results in higher axle loads, it provides advantages on rough, heavy-haul freight track. 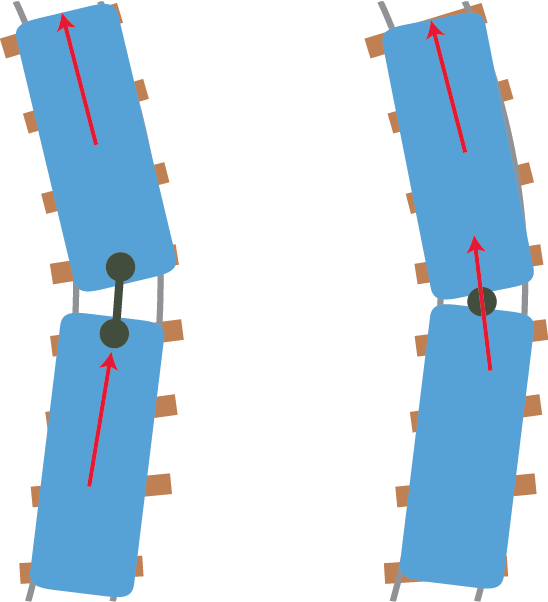 With individual cars, whether they are independently coupled or semi-permanently coupled, each car rides through a curve with independent motion, exerting its own forces against the outer rail. Shared trucks lessen lateral stresses on the roadbed as each car pulls the following car through a curve. The result is higher speeds through curves. Compared to traditional car designs (left), articulated trains that share wheels between cars (right) allow faster speeds on curves and ride smoother on rough track. Railroad wheels are heavy. A single 36-inch rail wheel can weigh more than a ton. Shared trucks reduce the number of wheels and the weight of the train, letting trains accelerate faster and reducing wear on the track. The articulation joints cause the ride to be much smoother because each car isn’t bouncing around on its own. Because the car ends do not hang over the truck, the effective width of the train through curves is reduced and articulated trains can be as much as 8” wider than conventional trains for the same track and tunnel profiles. This allows for wider aisles and seats, improving comfort. Tilting trains lean into curves to allow faster speeds without sacrificing passenger comfort. Tilting trains lean into curves, much like a cyclist does, reducing the feeling of side-to-side forces in sharp curves. This allows trains to travel faster on older, curvy track while maintaining passenger comfort. Switching to tilting Talgo trains on Amtrak's Cascades corridor in the Pacfic Northwest cut 30 minutes of travel time from the 150 mile trip. Tilting trains could save a similar amount of time on the trip between Chicago and Detroit. Your support helps MHSRA inform decision-makers about the benefits of fast trains. Most Amtrak and commuter trains in the U.S., including Metra trains in Chicago, are pulled by diesel locomotives. Tracks with the heaviest volume of trains should be electrified, and other routes would be better off with multiple-unit trains instead of locomotives. However, some routes and services are still best served by diesel locomotives. Most of the locomotives in use today are old, dirty and inefficient. Amtrak and Metra should purchase new locomotives that meet the latest Tier 4 emissions standards. Tier 4 locomotives emit 86% less nitrous oxide, hydrocarbons and particulate matter than most locomotives in use today, which are usually Tier 0 or older. They also emit 70% less carbon monoxide. Beyond having much cleaner exhaust, modern Tier 4 locomotives are usually more powerful and more fuel efficient. This lets operators haul longer or faster trains while spending less on fuel. Tier 4 locomotives are cleaner and more fuel efficient. Amtrak already operates 33 new Tier 4 locomotives on trains around the Midwest, and it is now looking to order up to 75 more. Metra is also looking to buy as many as 42 new locomotives. Both agencies are considering rebuilding current locomotives instead of buying new ones, which would come with a lower upfront cost, but also fewer long-term benefits. Commuter rail operators in Toronto and Los Angeles have both opted go with Tier 4 locomotives for routes they are not electrifying. The CEO of L.A.’s Metrolink told the Los Angeles Times that “the business case is there” for going with Tier 4. “We thought that rebuilding our old locomotives was a good deal, but we’ve learned that buying new engines is better… The new Tier 4s have up to 1,700 more horsepower, use up to 8 percent less fuel per mile, have longer service lives and are more reliable than rebuilt engines.” He also pointed out that replacement parts will be cheaper and easier to find for new locomotives, compared to rebuilt ones. Metrolinx, which operates GO Transit in Toronto, has also committed to Tier 4. 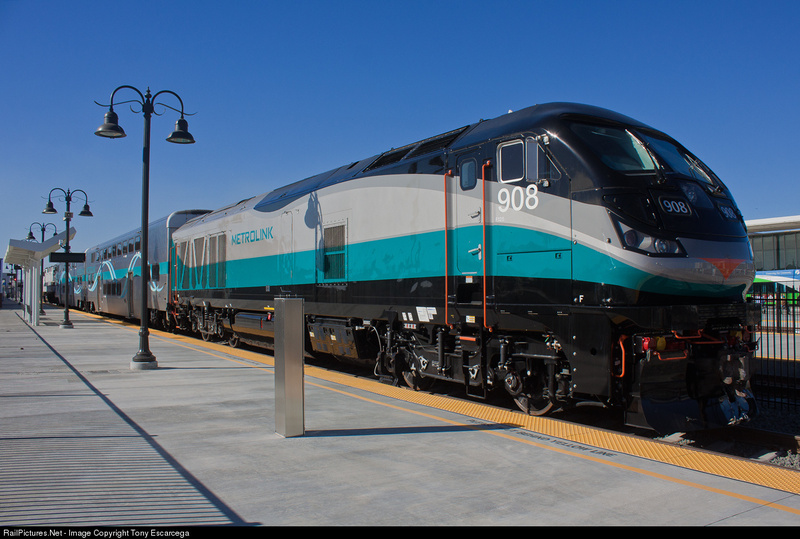 For both agencies, the long-term fuel savings and operational benefits of new locomotives are greater than the upfront cost. 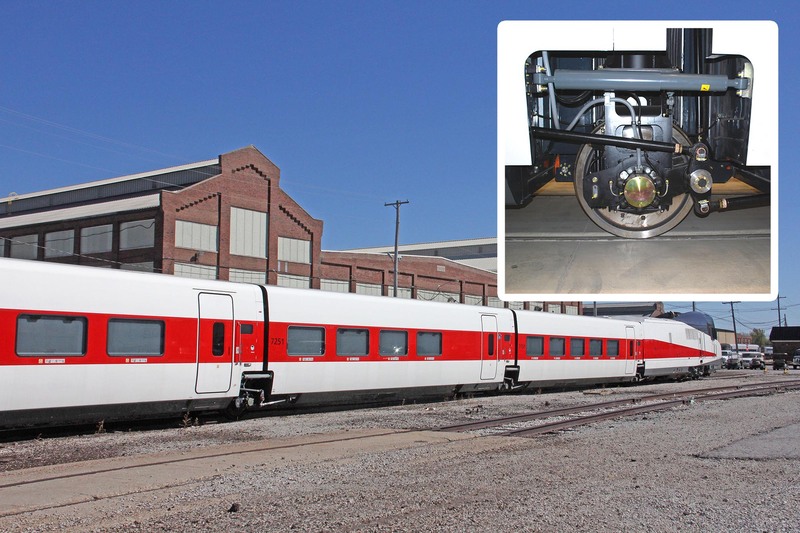 Ready for new Metra cars? Tell Springfield.